A food and fitness blog from a dedicated CrossFitter following the paleo lifestyle. Starter Series: 2. Eat Vegetables. So this week we embark on the second guideline of our paleo-style mantra: Eat meat and vegetables, nuts and seeds, some starch, little fruit, little dairy, and no sugar, no grains, and no legumes. We'll identify some key attributes of veggies and get on to the all important discussion of how to get your kids to eat them. Then, what you have all been waiting for--the recipe! Onward, ho! Some important vitamins, minerals, and compounds vegetables provide include fiber, magnesium, chromium, potassium, calcium, folate, vitamin C, vitamin A, and phytochemicals like antioxidants. I was going to embark upon an in-depth foray into each of these, but it just got too damn boring. I will spare you some brain cells. If you really want to check them out, good sources for more information are: the Linus Pauling Institute from Oregon State University and the World's Healthiest Foods. Despite the numerous benefits of plant foods (and you are just going to have to take my word for it, sorry Levar Burton), I am having a hard time finding vegetables as the primary source for most vitamins and minerals. Animal meat (including eggs and fish and especially liver) is right up there with most plant sources. Okay, fiber and phytochemicals are only obtained through plants, but all of the others can be found in meat. Why is this? Well, animals eat plants, so the vitamins and minerals wind up in their tissues, just like they are in ours. Since animal tissues closely match the array of nutrients we also need in ours, they are a great source for nutrients. However, the forms of these nutrients are often different from those in plants. Sometimes that is beneficial, as they don't require processing inside our bodies, and sometimes that source is too diluted or not as bioavailable as it is in plants. We'll continue our discussion of vegetables (and meat) in "Why No Grain" coming up in our Starter Series. Fiber is a biggie. Plant cell walls cannot be broken down by our bodies--we CANNOT digest cellulose. Realizing this fact was life-changing for me. Like many, I went through a "cool" teenage vegetarian stage and based my whole worldview around eating plants (yeah, and some dairy--hard to give up cheese!). It was mostly just to piss off my parents and not eat what The Man told me to eat. I survived, just as I somehow survived my days of subsisting off of breakfast cereal for three meals a day in college. Neither was ideal. But realizing that humans differ from cows, that we cannot digest most of what a plant IS, came as a shock. Paradigm shifted. In addition to the vitamins, minerals, and fiber they provide, plants also provide phytochemicals like flavonoids and carotenoids, some of which are useful as antioxidants in our bodies to keep harmful, cancer-causing free radicals at bay. Antioxidants also play a particularly important role in protecting against the oxidation of LDL cholesterol, which has been linked to heart disease much more reliably than overall cholesterol, HDL/LDL ratio, or total LDL count. More specifically, garlic has been found to reduce LDL oxidation. There seems to be a correlation between eating more fruits and veggies and reduced risk of cancer, cardiovascular disease, stroke, and high blood pressure. For example, cruciferous vegetables (brussels sprouts, broccoli, cauliflower, kale, cabbage, etc.) contain sulfur compounds that may protect against lung and digestive tract cancers. Bottom-line: veggies are good for you. Duh! A BIG problem for most parents is getting the kids to eat veggies. Sometimes they won't even try what you make. I am not a big fan of the "hidden veggies" strategy some parents use to trick their kids into eating their veggies. That defeats the purpose. While you may be nourishing them, the kids aren't adopting healthy eating habits and aren't learning anything about nutrition. In fact, you are merely strengthening their view that veggies aren't meant to be enjoyed, that they have to be drowned in other flavors to be palatable. Vegetables need more appreciation and should contribute to (not detract from) a tasty, healthy meal. 1. Unleash your kids in the produce department. Allow them to find and bring back interesting veggies to take home and try. Together, you can research recipes with them and agree on something that looks tasty. This is a great way to get your kids involved in their health. 2. Plan meals together, as a family, and agree upon vegetable preparations that will please everyone. This method gets your kids involved in meal preparation and let's them take responsibility for eating what they agreed to make. If they can't agree (surprise, surprise! ), take turns choosing the veggie the family will eat and always have a backup veggie like carrots, celery, and salad that should be permanent residents of your refrigerator. Ever try snacking on romaine hearts? If not, you're missing out. Seriously! 3. Cook together. I know this is a luxury for many families, but with whatever time you have however often you can manage, get your kids to cook with you. Seeing what it takes to bring food to the plate is a great learning experience and builds their life skills. These are lessons they won't learn in most schools. Teach them how to cook. It's a gift that will set them down the right path in life. 4. Hedge your bets. I never make an entirely new meal filled with all new ingredients we are trying out for the first time. That sets the stage for disaster. Instead, pair some old stand-bys with something new--this way, there is always something good to remember about the meal and most of it can be eaten, even if the new item is a flop. For example, pair new veggie preparations with your family's favorite meats. Always have a backup veggie for emergencies, like carrots or salad (sorry, potato chips don't count). Encourage your children to try new veggies, but also allow them to fall back on healthy alternatives. For example, I am sure we have all been through a "I'm not eating what my parents make" phase. For me, I had bread and cheese every night. Of course, now I realize what an idiot I was and that I should have just subbed out the meat and/or veggies with ones I could stomach, that were MY choice--take that Mom and Dad! 5. Do as I say AND as I do. You are your child's role model, whether they want to admit it or not. If you make the effort to eat healthy, so will they. Lead by example. You can control the food in your house. Take charge! Today's recipe is Noodle Nosh. Scared to give up noodles? Fear no more. Crave those stringy strands of deliciousness? I have just the thing and it works perfectly. Kelp noodles. I know, I know, kelp? Doesn't that just conjure up fishy, saltwater memories of getting tangled up in slimy ickness? Well, today we're creating new memories. Kelp is, as Alton Brown would say, "good eats." So without further ado, here is our recipe! Crunchy, noodley and filled with delicious flavor--this subs for take-out any day! First, heat a skillet or wok over medium-medium high heat. Add 1T sesame oil and all of the chopped garlic. Once popping/sizzling, add the beef and brown each side. Add some Tamari (like 1t or so) while cooking. Once each side has some color but before it's cooked through (I hate overcooked beef), remove the beef from the pan into a bowl (keeping the juice inside the pan). Now, add 1T of sesame oil and the mushrooms and give them a couple of minutes to lose their water and shrink. Then, add the broccoli slaw and add more Tamari. Cook for a few minutes to soften the slaw. Then, add the kelp noodles, breaking up the clumping strands. Stir into the slaw to incorporate. Cook for a minute to warm the noodles and distribute them. Then, add the beef back in, stir and adjust flavoring as needed (add more Tamari or sesame oil and desired). Turn off the heat, remove the dish to a bowl, serve portions, and enjoy feasting upon some delicious, healthy noodles that trump Chinese take-out hands down! Seaweed doesn't require arable land, fresh water or fertilizer. Kelp grows swiftly -- 2 feet a day in some species -- and produces no runoff or erosion. It cleanses the water of excess nutrients and absorbs carbon dioxide, a greenhouse gas that contributes to global warming. Broccoli is a cruciferous vegetable, which we mentioned earlier. It is also high in vitamins and protective against an array of ailments. Carrots are beta-carotene powerhouses, the richest vegetable source. Being good for healthy eyesight is just one of their benefits. Garlic also had an earlier mention as protective against LDL oxidation. It is also a great source of B6 and vitamin C and selenium. Garlic has cardiovascular health benefits and boosts immunity. Shiitake mushrooms also have powerful antioxidants and promote a healthy heart and immune system. Although their nutrient content is low, they are still sources of vitamin C and iron. Couple of caveats: the sesame oil is high in omega-6 fatty acids, so use it modestly and try to choose higher omega-3 fatty acids to balance it out: grass-fed beef and fish oil supplementation. Wheat-free Tamari sauce is a paleo-cheat that I rarely indulge in. While it doesn't contain wheat (yay! ), it does contain soy (boo!) and lots of sodium (boo! ); however, the fermentation process (like an 18 months-brine bath) strips the soy of most lectins and anti-nutrients, so it is considered safe for us to eat, in moderation. I guess this is like sugars--ideally, ditch them, but we know that most people need to indulge every once and a while, so here is an acceptable cheat with minimized repercussions. The processing required in this meal is more than I would like, but we need to be realistic. The broccoli slaw could be home-made with a noodle peeler (see my zucchini noodle recipe), but this time I erred on convenience and bought the packaged slaw from the store. Making everything from scratch and only buying local products is rough. I respect those able to dedicate themselves to their food to that extent. Unfortunately, at 7:30 on a weeknight, I am NOT one of those people. So hopefully I have added a new meal to your culinary repertoire capable of meeting the everyone's basic requirements: a) healthy and b) fast! Let me know how you like it! I have been meaning to write up a Starter Series for those of you new to the blog and future visitors. I know there are recipes buried in long-ish posts (I'll try to sort those easier for you in the future, for now, I suggest search or keyword/tag and using the Starter Series). I also realize that some of the rants might scare away potential readers because they lack the context of knowing what the paleo lifestyle is all about. So let me explain why I eat the way I eat. Living paleo-style is built on some core principles: Eat meat and veggies, nuts and seeds, some fruit, little starch, little dairy, no sugar, no grains, and no legumes (we'll talk more about dairy and why it's "little" instead of "no" when we get there). Fish oil and vitamin D supplementation will also be discussed in good time. Note: this isn't strictly Paleo, Primal, Zone, or the CrossFit dietary prescription; it's just my take on what works best for me and for many others, and no, it's not a diet--it's a lifestyle built for long-term sustainability. The types of meat are preferably grass-fed (if the animal eats grass; if not, then whatever the animal would eat in the wild), organic, and pasture-raised. The less-processed, the better. Eggs (from pasture-raised poultry eating a wild diet and possibly supplemented with flaxseed for higher omega-3 content) and seafood (wild caught and coinciding with the best choices on the Seafood Watch List) would fall into the meat category. Animal fats would also fall into this category, and they are healthy despite what the saturated fat myth-perpetuators would have you believe. For more information, here is my post of grass-fed beef and another on eggs. Humans eating meat has a long evolutionary history. There are theories about our large brains, tool use, social complexity, and aptitude to cover the globe that focus on meat as the impetus for these evolutionary changes. Eating meat does not separate us from all of our great ape cousins (for example, chimpanzees hunt too), but the regularity of meat in our diet over millions of years has set us apart. In The Omnivore's Dilemma, Michael Pollan discusses how our biology (gut, teeth, and jaws) is that of an omnivore--an eater of both plant and meat. We require essential fats and amino acids that match those present in other animals. The most efficient way to meet those requirements without risk of deficiency is to eat meat. This is a biological reality. 1. Meat, since its from animals (not so different from ourselves), provides a complete protein source filled with a full complement of essential amino acids, which we require from our diet (we cannot synthesize them in our body). Yes, you can get small amounts of protein from plants, but they are ALWAYS incomplete, lacking some essential amino acids you need to survive, and they are ALWAYS poor protein sources because plant protein is encased in cellulose cell walls that we were not built to digest, unlike ruminants (ex. cows). It is simplest to obtain what we need from the most complete source: meat. 2. Meat provides essential fatty acids, omega-6s and omega-3s. Both are needed for our bodies to function and ideally there is approximately a 1:1 ratio of omega-6 to omega-3. However, our modern diets are looking more like 20:1. Too much omega-6 can be detrimental (producing harmful arachadonic acid leading to inflammation). Unfortunately, omega-6 saturates our modern diet though our use of vegetable oils in nearly everything (just try label shopping and be horrified by the ubiquity of "vegetable," canola, sunflower, corn, soybean, and safflower oils in almost everything boxed, jarred, canned, or bagged). We need to focus on getting more healthy omega-3 fatty acids back into our diet. Omega-3 is protective against disease and inflammation. It's source? Meat (which includes fish) [note: flaxseed is an omega-3 source too, but it has inefficient conversion to the EPA and DHA that are more beneficial omega-3 fatty acids and has been linked to prostate cancer]. However, not just any meat will do. Deep, cold-water fish and grass-fed meat are high in omega-3 fatty acids. Compared to grain-fed beef, grass-fed beef a vastly higher amount of omega-3 fatty acids and a better ratio between them and omega-6 (closer to 1:1). Grass-fed beef also contains two to three times more conjugated linoleic acid (CLA), which is protective against heart disease, diabetes, cancer, and obesity. Furthermore, grass-fed beef has twice as much beta-carotene (vitamin A precursor) than grain-fed beef, and three times more vitamin E. This nutritional profile is one reason why I suggest eating animals that eat what they evolved to eat, just like we should eat what we evolved to eat. 3. Meat provides vitamins and minerals essential to life. Vitamin B12 for one is ONLY naturally available in meat and meat products (like dairy) (other sources for vegetarians are fortified foods and supplements). Although some synthesis happens by bacteria in the body, food sources or supplementation is necessary to avoid deficiency. Vitamin B12 plays a vital role in metabolism, brain and nervous system functioning, and red blood cell formation. Without enough vitamin B12, you get anemia and can develop serious and potentially irreversible brain and nervous system complications. Sounds fun! Iron is also vital within our bodies for oxygen transport to the cells. A diet lacking enough iron can lead to iron deficiency anemia, which means the tissues aren't getting enough oxygen to function properly--they're suffocating. The iron in meat is more available than in plants. This means your body can digest and absorb animal sources of iron easier because their iron is not bound up in plant fiber and protein nor inhibited from being absorbed through anti-nutrient action. Yay, for not being anemic! Zinc is another mineral necessary to our metabolism and immune system health, and it more readily absorbed from meat than plant sources. The bioavailability of zinc in animal foods is superior because zinc absorption is not inhibited: phytates in plants bind to metallic elements like zinc so that we can't absorb them. The absorption of zinc from animal foods is enhanced by the presence of amino acids also found in animal foods. Zinc deficiency brings fun things like impaired physical and neuropsychological development and a compromised immune system. Other notable vitamins and minerals more readily absorbed from meat than plants include vitamin B6 (essential to your nervous system, metabolism, and blood) and selenium (integral to thyroid function, oxidative reactions, and joint health). As I already mentioned, grass-fed beef trumps grain-fed for its beta carotene (vitamin A precursor) and vitamin E content. Chicken notably is a great source of niacin, a vitamin essential for healthy DNA. Fish is an excellent source of potassium (integral to chemical reactions and cell membranes), magnesium (important to blood flow, chemical reactions, and protein synthesis), and phosphorus (a component of bones, cell membranes, blood cells, and DNA), in addition to high omega-3 fatty acids. Sounds like a superfood to me! 1. Eating meat wastes energy. The thought is that eating higher up the food chain, consumers instead of producers, takes more energy. The consumer had to eat loads of producers to survive, while those producers just harnessed ambient resources: water, sunlight, and minerals. There are some flaws in this argument, though. Besides the fact that we are omnivores and require essential amino acids and fatty acids meat is best able to provide, the whole consumer/producer concept is inaccurate. Producers are consumers too--they rely upon a healthy soil filled with microorganisms and minerals that nourish them as much as the sun and water required for energy production. They don't produce in a vacuum; they rely upon other organisms to survive and die, fertilizing the soil. You can't grow crops (even in a garden) without fertilizer or you'll deplete the soil and make it infertile. The Vegetarian Myth author Lierre Keith experienced this first hand when she tried to grow a garden without the killing or subjugation of animals. She found that the only sources for the essential nitrogen needed to grow plants is fertilizer, which either comes from manure or animal blood and bones (products of animal domestication) or from chemicals that require fossil fuels to produce (also from animals, albeit ancient ones). Producers consume the resources other organisms provide. Think "circle of life" (complete with singing meerkats and warthogs) rather than a linear model. For those that say the meat industry is more energy-wasting than agriculture, I agree in terms of factory-farmed meat. I wholly agree with ending that despicable industry. But for a more balanced argument, one must look at grass-fed, pastured, and wild caught to compare. While transport, processing, and distribution costs are based upon consumption, grain crops have a much higher reliance on fossil fuels for their cultivation. Both grass and grain crops need sun and water, but grains also need fossil fuel produced fertilizers and pesticides, while grass does not. Grain crops have a heavy reliance on humans to meet their needs, whereas healthy grassland just needs ruminants and a healthy ecosystem to thrive--it can exist on its own. Grassland is a more natural state than cropland, especially with our genetically modified monocrops. And if we can't eat the grass, why not utilize creatures that can? I believe that wise use of our resources (a focus on grass-fed, pastured, and wild-caught animal foods rather than grain crops) is better for our health, the health of our food sources, and the health of our planet. Just as grain crops are used for energy like biofuel, grass is another potential energy resource. Since less fossil fuel would be required to utilize grass for energy, compared to corn, the net energy gain would be more substantial. Like corn, grass can duel task as livestock feed and as an energy resource, with the added benefit of not sickening cows (and requiring them to be pumped full of antibiotics). Grass pellets are an efficient renewable energy source. Read more on this in argument #4 below. 2. Eating meat wastes grains fed to livestock that should feed starving people. Wow, this is a biggie. Let's skim the surface of a few parts. For one, grains shouldn't be fed to livestock. Period. Grains are not their natural diet and they make them sick. Same argument goes for us, whether or not we choose to admit it. Grains make us sick, for most of us perhaps not so acutely and observably as cows fed corn (although aren't we pumping ourselves full of antibiotics too? ), but human grain-eaters are slowing dying on the inside with impaired digestion and risk of a pandora's box of diseases. Read Pasta Sans Pasta and many of my other posts to find out more about grains. Finally, feeding starving people grains is not the answer. In addition to being of poor nutritional quality, grains given through charity lead to a recipient country's economic ruin as their own farmers can't compete with the handouts we provide. Why should they farm if we can provide food for free? There is more to this complex political and economic rat's nest in The Vegetarian Myth. I highly recommend it! 3. Eating meat is cruel. Factory farming is cruel. There is NO argument there. But if we support grass-fed beef producers, pastured pork and poultry farmers, and wild-caught seafood, we aren't supporting cruelty. We are trying to make a difference by eating what is healthiest for us, these animals, and the environment. 4. Eating meat wastes land. Contrary to popular belief, not all land is meant for agriculture. Most land is entirely unsuited to growing grains, so we have to pump in water and fertilizer and rely on chemicals to force our crops to grow. Water for agriculture is being sucked from natural sources, changing landscapes and destroying environments. Fertilizers, pesticides, and manure made toxic from antibiotics, hormones, and those ingested fertilizers and pesticides are flowing into the groundwater, rivers, and oceans disrupting environments and killing native wildlife. Those chemicals are even poisoning our own water sources. When do we realize we are trying to fit a square peg into a round hole with forcing agriculture? Grass converts the sun's energy into biomass without the need of fossil fuel chemicals as long as it is in a thriving ecosystem incorporating diverse animal and plant life. With rotation of ruminants that fertilize, compact the soil, and renew the vegetation, grasslands are a self-sustaining ecosystem. By contrast, monocrops are creating unproductive wastelands requiring more and more fossil fuel-derived chemicals to maintain. Grass grows more places naturally than does any grain. And since we don't eat grass, why not use it to feed our livestock? There is no competition. 5. Eating meat isn't healthy. If you look for it, there is a study out there to support it. Meat-eaters and vegetarians are both opinionated groups with personal, economical, political, and medical arguments in favor of their side. As such, meat has been implicated in cancers, heart disease, obesity, etc. The list goes on and on. I've already tackled the myth about "deadly" saturated fat, and debunked the "all cholesterol is bad cholesterol" myth in that post. Plus, my arguments about sugar and its relationship to diabetes and obesity should shift the metabolic burden on carbohydrate sources. See Fatphobia, Diabetes Doesn't Have to be Part of a Complete Breakfast, and Just Say No...To Juice? for more on this topic. Colon cancer has been linked to eating red meat in some studies, notably in North and South America, but there are so many contradictions (like Mormons, Argentinians, New Zealanders, Australians, etc. having lower incidence despite being hearty meat-eaters, while vegetarian Seventh Day Adventists have a higher incidence--huh???). Dr. Eads comments on the perpetuation of non-existant conclusions here. It is important to ask: what part do the refined grains in human diets and in the diets of conventional livestock play in this relationship? I'd like to see what health problems can be linked to eating pastured poultry and pork and grass-fed red meat. Then, there would be something to talk about. A frequently cited concern of very-low-carbohydrate diets is the potential for increased risk of renal disease associated with a higher protein intake. However, to date, no well-controlled randomized studies have evaluated the long-term effects of very-low-carbohydrate diets on renal function. This study provides preliminary evidence that long-term weight loss with a very-low-carbohydrate diet does not adversely affect renal function compared with a high-carbohydrate diet in obese individuals with normal renal function. Arguments about meat being unhealthy and unsafe due to its antibiotic, growth hormone, and pesticide content are true for factory-farmed meat (including conventional dairy). I couldn't agree more to rid this from your diet. However, grass-fed and pastured sources of meat don't rely on pesticide-ridden food or require heavy antibiotic dosages to survive (albeit wild fish still become toxic due to polluted environments, so take caution, but they are still more healthy than their farmed relatives who must endure overcrowded, toxic pens and are pumped full of antibiotics to keep them alive--sound familiar?). This is just more argument to feed animals the right way and use their resources wisely. Since grain crops require pesticides, unlike grass, the argument for grain over meat is hollow and gives more support to eating grass-fed meat and eliminating grains from your diet. 6. Eating meat is polluting. You mean more polluting than the pesticides and fertilizers (produced using fossil fuels, of course) necessary to force crops to grow in environments becoming less suitable to their growth due to over-farming? You mean more polluting than the energy required to harness distant water sources and fuel machinery to cultivate, transport, and process the "bounty"? Yes, factory-farm animal waste is polluting water sources because it is filled with antibiotics and pesticides passed through the animals forced to live on a toxic diet. Manure makes ideal fertilizer, when it comes from a clean diet. And the higher emissions argument for grass-fed as opposed to grain-fed cattle? The methane released from grass-fed cows is countered by properly ranged soil holding onto more carbon, which protects against drought and greenhouse gas emissions. It is also countered by a healthy ecosystem incorporating plants that reduce methane and soil bacteria that neutralize it. When it comes down to it--we are the ones who are polluting. But we have a choice to lessen that burden. We can choose to use our resources wisely and most efficiently. Grain-based diets are trying to fit a square peg into a round hole. To forgo meat is to turn your back on biological, financial, and political reality. Our burden on this planet can be lessened. In the case of raising animals, we can reduce our carbon footprint by eating grass-fed, pasture-raised, wild-caught meat. No doubt, there are more anti-meat arguments out there. But hopefully I provided you with some ammunition to fight back and proudly eat your meat. We'll continue this discussion in our future Starter Series: Why No Grain post. Here is a simple, delicious recipe to add to your breakfast repertoire. It can easily be Zone balanced with fat, carb, and protein if desired. You can also add some berries to give it more of a fruity kick. Warm and crunchy, with sweet cinnamon to wake you, this is breakfast. Start a skillet over medium high heat. Add coconut oil and get it hot. Then, add the apple to the skillet and dust with cinnamon. Cook until it starts to brown in the coconut oil. Add your chicken to the skillet. Toss it and the apples and dust with more cinnamon. Allow the chicken to crisp up a bit--this shouldn't take more than five minutes. Remove to a plate once you have desired softness with your apples and have warmed the chicken, creating some delicious crunchy bits. Dust with more cinnamon if you are a cinnamon fiend like me. Enjoy your healthy, balanced breakfast! Can't you just taste the caramelization? Yum! Many are plagued by this "disease," which grew strong in the late-20th century and has led to a full-blown fat-free hysteria. We've seen it everywhere from the general media to school lunchrooms and nutrition classes. It is perpetuated by the Mayo Clinic, American Heart Association, American Diabetes Association, and most influentially by the USDA. How can something so inGRAINed in our health knowledge be so wrong? The findings from the Women's Health Initiative Dietary Modification Trial came as a surprise to many Americans who have been hearing for years that reducing fat is important for long-term health. Yet long-term follow-up studies such as the Nurses Health Study have consistently found little relation between the percentage of calories from fat and risks of breast cancer, colon cancer, or coronary heart disease. Such studies are one reason why major reviews of diet and health during the last five years, including those conducted by the U.S. Institute of Medicine and the U.S. Dietary Guidelines Committee, have moved away from advocating low fat intake to an emphasis on the type of fat. Another large study found that the Atkins diet trumped the food pyramid standard diet, Zone Diet (40 carbs:30 protein:30 fat), and Ornish (high carb) at producing weight loss and decreasing risk of heart disease. What makes Atkins so different? It is the only very low-carb diet that was tested. Sure, eating bun-less cheese burgers and bacon might not be very healthy, but compared to low-fat diets and moderate- to high-carbohydrate diets, Atkins won. Looks to me like carbohydrates may be the real issue, not fat. If anything, the higher fat diets did better! Here is a (LONG) presentation from the Stanford lecture series on the findings of that study given by the lead researcher, a vegetarian. It is fun and filled with visuals, so it's worth the time and effort to watch. A good summary of it is here. So why aren't our healthcare sources catching up with the current research? Their tenacity to desperately hold on to out-dated policy calling for the reduction of fat IS NOT making us thin or protecting us from disease. It is perpetuating a myth. Just look at the general public consensus: we all know that fat makes us fat, right? From my school lunch post, we know this is still being taught in schools and infiltrates school menus. Bottom line: The low-fat and fat-free diet recommendation is NOT supported by current science. Fat is not some boogeyman of the macronutrients. Fat is essential, hence the essential fatty acids. Essential is a nifty term given to substances your body CANNOT make and HAS TO ingest through your diet. The essential fatty acids are alpha-linoleic acid (ALA), an omega-3 fatty acid, and linoleic acid (LA), an omega-6 fatty acid. Two other omega-3 fatty acids, eicosapentaenoic acid (EPA) and docosahexaenoic acid (DHA), are best consumed from dietary sources because although your body can synthesize them from ALA, the conversion is inefficient. The omega-6 fatty acids are prevalent in nuts, seeds, and vegetable oils. Omega-3s are rich in fish oil, fatty fish, chickens (and their eggs) fed flax and pastured, and grass-fed livestock. The increase in our use of vegetable oils and decreased consumption of fish and grass-fed livestock has lead to an overbalance of omega-6 to omega-3s in the typical American diet. While omega-6 fatty acids are still essential, too much leads to problems, while more omega-3s is protective of many diseases. Basically, the bottom line is ditch the veggie oils, supplement with fish oil, and eat pastured chickens and their eggs, wild fish, and grass-fed beef. You'll still get plenty of omega-6s. Okay, so now we know the dangers of giving up fat entirely. You can't live without essential fatty acids. But, fat-freers will still get plenty of omega-6 in their diets due to the prevalence of veggie oils in everything processed, despite the "fat free" labels ("fat free" can really just mean very little fat, not entirely without fat--same goes for "trans fat free"). However, where will fat-freers get their omega-3? the actual amount of carbohydrates required by humans for health is zero. Another job of fat is dissolving fat-soluable vitamins like vitamins A, D, E, and K. Fat-soluble vitamins are water-proof, meaning water can't break them down and you can only capture them and use them if you have fat to bind to them and take them where we need them to go. If you want to find out more about what each fat-soluable vitamin does for our body and how vital they are, read up on them here. So guess what happens to all the precious vitamin D and A fortified in our dairy when we drink skim milk? Flush! It is our fatphobia that has lead to this fortification because the typical American eats so little fatty natural sources of these vitamins (fatty fish, nuts, eggs, grass-fed meat, and oils). And with our busy lives we definitely do not get enough vitamin D synthesis from the sun, even those living in Florida, the Sunshine State! How about the health-conscious salad eater with fat-free dressing and dip for his/her veggies? Where do all those precious vitamins go? Flush, flush! Vitamins E, K, and A (precursors) are prevalent in leafy greens and carotenoids (for vitamin A). Without fat consumed along with veggies (also sources of these vitamins, itself), there is no absorption of these vitamins. Thus, the fat-free craze necessitated supplementation of essential fatty acids into our already highly processed foods because we were no longer eating natural sources of fat-soluble vitamins and couldn't absorb them from veggies alone. But this doesn't solve the problem if we still aren't eating any fat with the fortified foods! What replaces the fat in naturally fatty products like oils and butters? Give you a hint. It is a big C. In baking, a standard to reduce fat is to increase the sugar or use shortening or margarine instead of butter (more sugar to spike your blood sugar or hydrogenated oils and trans fat--which is the lesser evil?). Check out the carbohydrate in uber-popular Kraft Ranch Dressing and Kraft Fat Free Ranch Dressing. The fat free version has 11g of carbohydrate, compared to 3g for the regular ranch. Granted it only has one more gram per serving of sugar, but what the hell are the other unnamed carbohydrates in there? Remember, aside from the fiber, no matter the source: carbohydrate breaks down into sugar in your body. And without fat to slow down digestion and keep you feeling full longer, your blood is quickly flooded with glucose, insulin mobilizes to get it out and store excess as fat, gets too much out since so much insulin was required, and leaves you with a blood sugar crash, which brings irritability and hunger, again. Ingredients: WATER, SOYBEAN OIL, SUGAR, GARLIC JUICE, BUTTERMILK, CONTAINS LESS THAN 2% OF SALT, MODIFIED FOOD STARCH, WHEY, PHOSPHORIC ACID, MONOSODIUM GLUTAMATE, EGG WHITES, VINEGAR, XANTHAN GUM, CITRIC ACID, POLYSORBATE 60, SPICE, NATURAL FLAVOR, ENZYMES, WITH SODIUM LACTATE, NATAMYCIN, AND CALCIUM DISODIUM EDTA AS PRESERVATIVES. CONTAINS: MILK, EGG. Ingredients: WATER, CORN SYRUP, VINEGAR, HIGH FRUCTOSE CORN SYRUP, WHEY (FROM MILK), SALT, MODIFIED FOOD STARCH, CONTAINS LESS THAN 2% OF GARLIC JUICE, ONION JUICE, SOYBEAN OIL, XANTHAN GUM, POTASSIUM SORBATE AND CALCIUM DISODIUM EDTA AS PRESERVATIVES, ARTIFICIAL COLOR, PHOSPHORIC ACID, PROPYLENE GLYCOL ALGINATE, NATURAL FLAVOR, DRIED PARSLEY, DRIED GREEN ONIONS, DISODIUM GUANYLATE, DISODIUM INOSINATE, SPICE, CARAMEL COLOR, SULFITING AGENTS, YELLOW 5. I highlighted those ingredients that differ. At first glance, you can tell that the fat free version is making up for its reduction of fat with a plethora of pinatas--sorry, I mean ingredients, but since they carry within them a host of sugary treats, the slip is fitting. Both are unacceptable because I can't pronounce half of their ingredients or identify most of them as actual foods, besides the fact that there are just too damn many of them. But all that is besides the point. This is a case study of the average American, a ranch-dressing aficionado, told by the health community to choose fat free ranch over regular ranch dressing. The regular ranch gets its fat (at least it has some?) from soybean oil (a vegetable oil rich in omega-6 fatty acids we are trying to avoid) and sugar is up there as its #3 ingredient. Fat-free has sugar in the form of corn syrup AND high fructose corn syrup as its #2 and #4 ingredients. You already know my argument against high fructose corn syrup and the processing to create these frankensugars nauseates me. Do you really need sugar in your salad dressing? Monosodium Glutamate is MSG, which has a spotty history and may be responsible for symptoms like headaches, nausea, heart palpitations, and chest pain after eating MSG-laden foods. Disodium Gyanylate and Inosinate are a pair that take the place of MSG in the fat-free dressing. They provide saltiness and are derived from fish or yeast. Recommendations against asthmatics, those with gout, or babies using products with this couplet make me a little nervous. Citric Acid is a flavoring and preservative extracted from mould that eat sugar, mostly derived from corn sources. Like yeast-fed sugar, I would think that citric acid is a little outside the paleo diet. To note: Xanthum Gum is also usually corn-derived (it's also produced by bacteria fed corn-derived sugar). Most chemically processed additives are derived from grains, so be wary of them if not for their highly processed nature (ex. Modified Food Starch), but also for their hidden gluten and anti-nutrients. It would be nice to know the source of the "Sugar" and what the hell a generalization like "Enzymes" really means, "Spice" too while we're at it. What are they specifically and where do they come from??? I am also concerned about the milk source of the buttermilk and the egg whites. Without any guarantee that the animals were pastured and organic, I have no doubt they are animal products from brutal, inhumane factory farms. Doesn't matter how little we rely upon products from that industry--any use is complacency and keeps them in business. In both dressings there is something mysteriously called "Natural Flavor," but if it was actually natural flavor, why is it an additive? Hello contradiction! Basically, natural flavor is anything from plant or animal used to flavor food. Good luck tracking down that one to find out what you are actually eating. The fat-free dressing also has sinister-sounding "Artificial Color" with Caramel Color and Yellow #5 to boot. All this to get white dressing? Caramel color comes from sugar, usually derived from corn, which amongst other concerns begs the GMO question: what exactly are we eating? Sulfiting agents can be really bad for asthmatics and those sensitive to sulfur, and the fact that the FDA thought them dangerous enough to ban their use on foods eaten raw makes me nervous about their use in food products. Guess who Yellow #5 is also dangerous for? That's right! Asthmatics! Can you see a trend here? Those with the most compromised and sensitive digestive tracts are falling ill when consuming these artificially produced chemicals added to our foods. This might be a chicken and the egg question begging more research, but I see a connection here between a damaged digestive tract and asthma. What damages the digestive tract? Gluten (for one)! Hmm, does that mean asthmatics might be more inclined to have gluten-intolerance and seriously adverse reactions to gluten a la celiac disease? Not surprisingly, the answer is yes. Giving up gluten reduces asthma. That is a big home-run right there. Bottom line: Look before you eat. So let me connect the dots (la, la, la for those of you who remember PeeWee's Playhouse): the food industry replaces fat with carbohydrate (which breaks down into sugar) and derives most of its chemically processed additives from grains. The sugar puts our blood sugar regulation on over-drive leading to a host of problems, especially since we don't have any fat to mediate digestion and produce satiety. We lose valuable vitamins because we don't have the fat to absorb them. That is a runaway train of metabolic sickness on its own. Meanwhile, gluten, lectin, and anti-nutrients from grains in the typical American diet destroy a person's digestive tract. The inflammation, permeability problems, and inefficient, broken digestion that results is further exacerbated by those chemically produced food additives that are, no surprise: allergens! Asthmatics and celiacs are at greatest risk because they are hypersensitive, but when you look at the scientific evidence about what grains do to your body, aren't we all celiacs by varying degrees? Conclusion: The trade-off of fat for sugar, more carbohydrate, and more additives just isn't worth it. So it looks like fat isn't really all that bad for us after all. Whew! And I didn't even touch on the cholesterol myth or go into the nitty gritty of metabolism! We'll save those for another day. If you haven't read my saturated fat rant, please do. I know that is crazy controversial, but 'the truth is out there' if we are brave enough to digest it. I think our society has made great sacrifices in our health by throwing out the fat in our diets and replacing it with more processed frankenfoods at worse, sugar and more carbohydrates at best. And that isn't saying much if carbohydrate is really to blame for our obesity epidemic and the modern Four Horsemen of the Apocalypse: heart disease, diabetes, cancer, and stroke. But then, this challenges a paradigm backed by national commodities like wheat, corn, rice, and beans. Their production is subsidized and their use is required in public schools. This is where money and power diverge with nutrition. Bottom line: Fat is healthy. Seriously. Obviously, you should choose natural sources with as little processing as possible, but that goes for everything. Duh. Healthy sources are olive oil, coconut oil, nut oils in moderation, animal fat, fish oil, avocados, and if you partake in dairy: butter, whole milk, and cream from raw, grass-fed sources. For more information, see Mark's Daily Apple's Definitive Guide to Oils and a Primal Primer: Animal Fats. Ditch the fat-free frankenfoods. Don't be afraid to give yourself a little "indulgence" and enjoy healthy fat! Make sure you have some at EVERY SINGLE MEAL! The crisp, buttery crunch of this mix make for divine snacking! Roast your pecans and coconut on sheet pans in a 350 degree oven (no need to preheat--you can just use the preheat as a timer for checking done-ness) or one batch at a time in a large skillet over medium heat. Watch them carefully, because one minute they are browning, the next burnt to a crisp. Seriously--my record is about even with burning versus success. Remember, their bottoms will brown and burn, so toss them to keep checking. You'll smell their fragrant roasty toasty-ness when they're done and the color will be a dark, golden brown. This should take less than 15 minutes. While your nuts and coconut are roasting in the oven or cooling, start a large skillet over medium heat. Add the butter and brown the butter--which means stirring intermittently while it foams, loses its bubbles, and begins to brown. Doesn't it smell like cheese? Isn't that incredible? REAL butter actually has a taste and smell! Now you understand why I said raw, grassfed butter! Back to the cooking: Watch the butter carefully for a change in color from yellow, to amber, to deep golden brown. It won't take too long--say within 10 minutes. Pull the plug once you've hit GB&D (golden brown and delicious--but, of course, singeing your tongue isn't necessary--smell and color will suffice). Immediately remove from heat and throw in your roasted coconut and pecans. Toss well and salt. Remove to a covered container (try not to use plastic as the fat likes to bind with plastic and it makes cleaning really tough). Whack 'er in the refrigerator to cool and for storage (I know it is torture to wait, but it tastes better once cooled, believe me--also, burning your fingers and mouth to snack on molten nuts isn't really fun). Once cooled, enjoy crunching on this AMAZING mix! It's very satisfying and decadently delicious! I apologize in advance for being wordy lately. You are forewarned. Truth is, I am passionate about nutrition, so much so that I am often screaming on the inside with frustration at the world. Today is no different, but I want to share my frustration and the sunshine of hope for change. Some people are on the right track, we just need to enlist more! 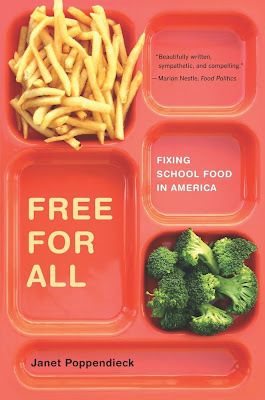 Today I attended a luncheon to highlight author and sociology professor Jan Poppendieck and her new book, Free For All: Fixing School Food in America. To be honest, I haven't read her book yet, but let me report on my experiences today. If you are a parent or just a concerned citizen like me, please read this and help! First off, I totally agree that school lunch is a problem, a serious problem and it needs fixing. There is a problem when tater tots and pizza are still on the menu even at "progressive" school districts like those in Santa Cruz. Looking at the menu for elementary school lunches shows only 3 days out of 18 without cheese. Pasta and bread are present every day. Further digging into the website shows fat-phobia (low-fat everything is promoted) and misinformed juice and smoothie recommendations. We won't even go into the "healthy" whole grains. For instance, as a snack idea, Katie Jeffrey-Lunn, MS, RD, CDN, LDN recommends combining at least two of the five food groups into a healthy snack. Try to imagine the effects of cereal and fruit, both high glycemic, without any satiating fat or protein to balance that sugar intake. Talk about sugar high, binge eating, and inevitable crash. Bet that is satisfying. Okay, no argument that there is a problem with school lunches. Jan Poppendieck recommends attacking the problem at a systemic level. She wants universal school lunches available to every student--no more selling food to kids. Among the benefits, she listed a relaxing, enjoyable, shared lunchtime experience similar to that she remembers from summer camp. No one has to stress over food or money or the social stigma attached to kids who can and can't pay for their lunch. I can relate to this as one of the "weird" kids who brought a peanut butter and jelly sandwich every. single. day. I never had the money to supplement my lunch with snack foods until high school and then the cookie and snack cake options were a daily regularity for me. The fact that ubiquitous junk food in schools has not improved and has only gotten worse is disturbing to say the least. Is that how we want to be fueling the minds of our youth? Next, Jan went over her ABCs of the school food crisis. "A" is for a la carte food items that undermine the nutritional integrity of the lunch program. She asked how schools can offer a healthy menu while still offering junk food on the side. School lunch should be an extension of the nutritional education, not in direct contradiction with it. "B" is for business and bottom-line. Kids are unable to make informed, responsible decisions because they have been bombarded with multi-billion dollar ad campaigns targeting them as junk food consumers. She advocated for school leaders to say NO to the junk food vendors; that money from junk food is not worth the health (I would add "or moral") price. "C" is for the chilling culture of compliance. The current three-tier system of free, reduced-price, and full price is an administrative nightmare. A universal school lunch program would be more efficient and save money in the long run, although its start-up would be very costly. She asked for school leaders to see the educational potential in making school lunch part of the curriculum, practicing what we preach. To fund this bold plan, she introduced the plan to tax soda and use the revenue to fund school lunch programs. So here are the issues I want to tackle. Doubtless there are hundreds more, but let's just start somewhere. Problem #1: The public (this includes educators and those making policy) does not see the sugar in grains or grasp the full extent of sugar infiltration into our food products. Grains are a hidden sugar. Heck the the American Diabetes Association doesn't see the sugar in grains. They list whole grains among their Superfoods and of course fat-free milk and yogurt, without a distinction of source, so you can get a nice, healthy dose of grains from those grain-fed cows. ALL carbohydrate breaks down into sugar, and sugar spikes blood sugar. Fiber and fat mitigate the situation, but processing grains makes them high glycemic and no amount of fiber is going to fix that. And don't tell me about all the vitamins and minerals we are missing out on by not consuming bread, pasta, and rice. It's called vegetables, people. Go to the source. We all know that sugar is bad for us, so we don't eat candy. Problem solved, right? Wrong. What the public doesn't understand is that sugar is in nearly everything. And I'm not talking about the hidden sugar of grains (which I might add are in everything too! ); it's real sugar and its guises as high fructose corn syrup, honey, agave, maltodextrin, splenda, xylitol, glucose, fructose, etc. Sugar is in your condiments and tomato sauce, your dried fruit and frozen meals, and especially in your ranch dressing on top of your healthy salad. It's in your chips and dips, sauces and spices, and baby foods. It's in your sandwich bread and processed meats. It's in your bottled beverages, even sports drinks and vitamin-enriched water. Need I go on? Women who drink one can of soda a day, increase their risk of type 2 diabetes by 83%. OMG! Isn't that a wake up call? How can we allow schools to sell such poison in the cafeteria or vending machines or to allow kids to bring it from home? What are we doing to our kids? Problem #2: A revolution in school lunches requires funding, lots of funding. One way proposed by Jan was a soda tax. The revenue from taxing soda could fund an overhaul to the school lunch program. But my god, we couldn't even agree on a soda tax! Most people were for it, but the naysayers were scared of overregulation and losing funding if soda consumption actually decreased. Isn't it worth the risk? What makes soda any different from tobacco? Does it have any redeeming qualities? Problem #3: If educators and educational planners cannot serve themselves healthy food, how can they expect to serve students healthy food? Our menu at the luncheon consisted of mixed green salad with a choice of soybean-red wine vinegar herb dressing or miso dressing, beets with red onions, cooked herbed carrots, cooked broccoli, whole grain rolls, corn crumb-breaded chicken, and some sort of cheesy pasta. Okay, you know by now what I would say about the whole grain rolls, miso dressing (it's soybean based and likely sweetened), pasta, and corn-crusted likely factory farmed battery cage chicken. But soybean oil--are you serious?!? Vegetable oils including soybean oil and canola oil are highly processed, often partially hydrogenated (yummy trans fat! ), and too high in omega-6 fatty acids (remember, we want to decrease the ratio of omega-6 to omega-3 fatty acids, since omega-6 are associated with health problems and omega-3s are much more beneficial). I had the veggies sans dressing and felt like an alien. In addition to the lunch buffet table was a table (a whole table!!!) devoted to cookies. Here we are trying to fix school lunches and we can't even go a meal without a freakin' cookie! Are you serious?!? How can we expect to feed kids the right way when we can't even feed ourselves healthy foods? The biggest problem: NO ONE (except my paleo friend and I) took issue with this meal. It was praised by all. Can you hear my inner voice screaming with frustration? Problem #4: If educators don't have the information on what is healthy, how can they teach nutrition to students? There is no consensus about what is actually healthy food. I have my take and I believe it is backed by solid scientific studies, but I know that Nestle and Kraft and General Mills are all funding research to back their products, to find data to support their "high fructose corn syrup is okay in moderation" ideology. Want to be sick? Check out the Corn Refiners Association's Sweet Surprise website showing how "natural" high fructose corn syrup is because it comes from corn, a natural grain. We'll leave out the discussion of GMOs and how corn production is anything but natural, requiring fifty gallons of oil for pesticides and fertilizers to produce an acre of corn on land totally unsuited to large-scale agriculture (read The Vegetarian Myth for more brain-food). Problem #5: Why me? Why should I care? Who am I to do anything about this? Why can't we just keep feeding our kids the same old crap and have some other generation clean up the mess? Why should it be us? Why doesn't the government care about us and eliminate the poisons in our food? Why do we actually have to be adults and do something about it? Why, why, why--who does this sound like? Here's why: The benefits of a universal school lunch program overwhelmingly defeat the costs. Jan lists the camaraderie of the children who get a stress-free, healthy lunch. Kids wouldn't have to spend money on food or drink, stigmatize themselves for their ability or lack of ability to purchase items, or rely upon their skewed sense of what is healthy from years of advertisement bombardment and relatively little nutritional teaching. School food can illustrate health lessons by introducing kids to unfamiliar fruits and vegetables, improve their eating habits, and help them integrate their learning with practical applications. Changes taken now might be costly, but they'll pay for themselves in reduced healthcare costs down the line. It'll be cheaper in the long run to eliminate the administrative burden of the three-tier system. It'll reduce the cost and waste of preparing meals that go uneaten now since student participation is voluntary. It'll create healthy bodies and fuel young minds. In Santa Cruz, we are in a unique location to support our schools through our rich agricultural and meat production resources. There are local organic farms, grass fed cattle, and free range poultry all at our doorstep. Why don't we take this opportunity to support local business and supply local, healthy foods to our schools? Remove the junk! Am I just spouting insanity or do you want to help make this happen? As Willy Elliott-McCrea from Second Harvest Food Bank said today, "It isn't a matter of can we do this, but will we." For more information about Jan Poppendieck, here is an interview with Jan at salon.com. Her book is purchasable through Amazon. For more information on Fixing School Lunches check out the Go For Health! initiative at the United Way, UCSC Center for Agroecology and Sustainable Food Systems, Community Alliance with Family Farmers, Pajaro Valley Community Health Trust, Santa Cruz County Office of Education, and Santa Cruz Education Foundation. Representative Sam Farr is sponsoring the Children's Fruit and Vegetable Act to provide more funding for school food. Ask Speaker Nancy Pelosi to support the Child Nutrition Reauthorization 2010 to invest in child nutrition programs through this Second Harvest Food Bank form. CrossFitter, CrossFit Trainer, and paleo-afficionado, I am following my dreams in Santa Cruz, CA. Through CrossFit and this blog, I want to pass on some of the insight I have found through trial and error to help make more people happy, healthy, and functionally fit. Starter Series: 1. Eat meat. Starter Series: 3. Eat fat. Why No Sugar III: Just Say No...to Juice? NOTE: This website is my opinion, NOT medical advice. EAT MEAT (preferably grass-fed, pastured, and organic) AND VEGETABLES (preferably fresh, seasonal, and local), HEALTHY FAT (like nuts and seeds [not in excess], avocado, coconut oil, olive oil, and pastured butter), SOME FRUIT (preferably fresh, seasonal, and local), LITTLE STARCH, LITTLE TO NO PROCESSED FOODS, and LITTLE TO NO DAIRY (this is a point of contention, so use your gut as your guide and go raw and grass-fed if you do partake), NO GRAINS OF ANY KIND (yes that means quinoa), NO SUGAR (avoid added sweeteners of any kind as much as you can), and NO LEGUMES (otherwise known as beans, and yes, this includes peanuts). Seriously, don't get hung up on the "NO's." There is more I CAN have than that I CAN'T, so I am NOT starving myself or getting malnourished! This is not some crazy fad diet; this is a lifestyle with a healthy diet catering to health and longevity crafted by looking at the foods we, as humans, were designed to eat and which we have eaten over thousands of years. I have chosen foods that nourish and aid health, not harm. I am eating quite well, as my food blog will attest!